Every edition of the FIFA World Cup presents an opportunity to witness and experience the use of a new football. The football used for the world cup tournaments usually go through rigorous manufacturing and testing procedure. This is as a result of FIFA’s continuous commitment to ensure optimum competition conditions at every level of the game. From the 1930 tournament where the Tiento ball was used to the 1950 edition where the Duplo T, the first ball to have the syringe valve, host countries were usually required to provide the balls which were used during the matches. However, in 1962, the Crack Top Star was to be used in the World Cup in Chile but veteran FIFA referee Ken Aston was unimpressed with the ball provided by the Chileans for the opening match against Italy. He had to send for a European ball which was used for the second half. Various matches during the tournament also used different balls, with rumors that most of the European teams didn't trust the locally produced balls. And so to ensure quality control, uniformity and better visibility on monochrome TV screens, FIFA from the 1970 edition Mexico began to take responsibility for providing the match balls for its competitions, partnering with sports equipment manufacturing giant Adidas. 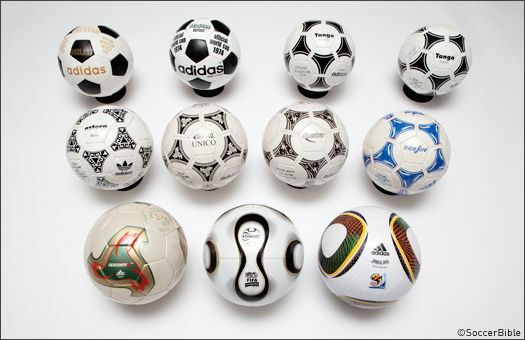 From then till date, there have been 13 official FIFA match balls all produced by Adidas. This time, the Russia 2018 world cup match ball is named 'Telstar 18', a design which is a reimaging of the original Telstar of 1970 World cup. There have been 13 editions of the tournament since 1970 and below, Colossus Gists draws you a list of the names and photos of all the official match balls for the competition.